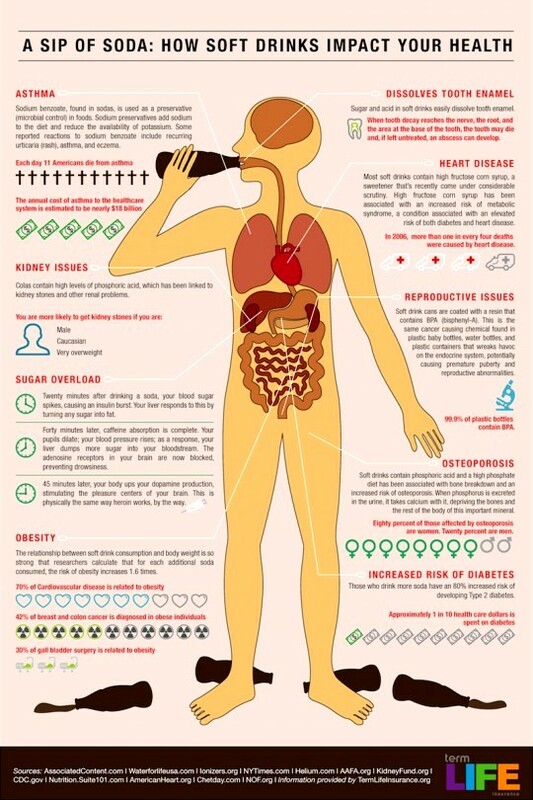 As soon as soda's swallowed, the pancreas is notified and rapidly begins to create insulin in response to the sugar. Insulin is a hormone the body uses to move sugar from food or drink into the bloodstream, where cells are then able to use sugar for energy. Within just 20 minutes, blood sugar levels spike and the liver responds to the insulin by turning sugar into fat for storage. 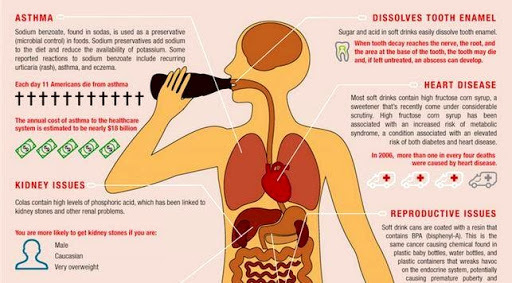 Within 45 minutes of gulping down a single 20-ounce glass of soda, caffeine from the drink is fully absorbed, and as a result your pupils dilate and blood pressure rises. The body produces more dopamine, which stimulates the pleasure centers of the brain - just like a low-grade line of cocaine. When the hour chimes, the body begins to experience a blood sugar crash, which is around the same time a person reaches for their second soda, or for another sweet and sugar snack to suffice. Soda's connection to the obesity epidemic is so intertwined, Harvard researchers have calculated each additional soda consumed increases the risk of obesity 1.6 times. In addition to the threat of reaching obese levels, researchers also found after following 40,000 men for two decades, those who drank a sugary beverage each day had a 20 percent increased risk of having a heart attack. The high fructose corn syrup - a cheap replacement for cane sugar - has been associated with increased risk of metabolic syndrome, which leads to diabetes and heart disease. Beverage companies know the haphazard sugar cycle all too well. In the United States, they spend approximately $3.2 billion in marketing each year in an effort to tempt consumers to pick up a liter of brown bubbly sugar with their pizza, or a case of cans for their child's next birthday party. Those little children have an 80 percent increased risk of developing type 2 diabetes if they become regular soda drinkers. Their future will be one full of kidney problems, reproductive issues, osteoporosis, asthma, and bad teeth with dissolved tooth enamel.